Wrangling cattle hydraulic machine is the latest successful development of the modern cattle stripping equipment, automated assembly line is mainly used for cattle or horse operations use hydraulic stripping. This device uses hydraulic drive system, changing the cumbersome old-fashioned mechanical transmission and hydraulic drive heavy, in the structural design is more simple, reliable, and easy maintenance. No noise during use, smooth operation and safety, convenience, industrial machinery in the meat slaughtering process equipment indispensable. Line is mainly used for cattle wrangling. A. The whole machine adopts mechanical drive, the cattle pollution. B. run a smooth, long service life. C. to continuous production and high efficiency. D. simple, less wearing parts. 2) Rated control voltage range of 380V ± 15% working reliably. 1) This machine is passing by the passing drum machine frame ﹑ ﹑ ﹑ passing car down transmission, hydraulic and other components. Pre skinless beef carcass into the passing station after passing down the top position in the car-liter, two fixtures will be leather grip. and then also open the motor, drum wrangling began arguing back and forth; uniform car fell down together to complete the passing action. pine bark increased when the passing car; passing roller reversal. The equipment in use must be tied with the aerodynamic lift and cattle pile together. 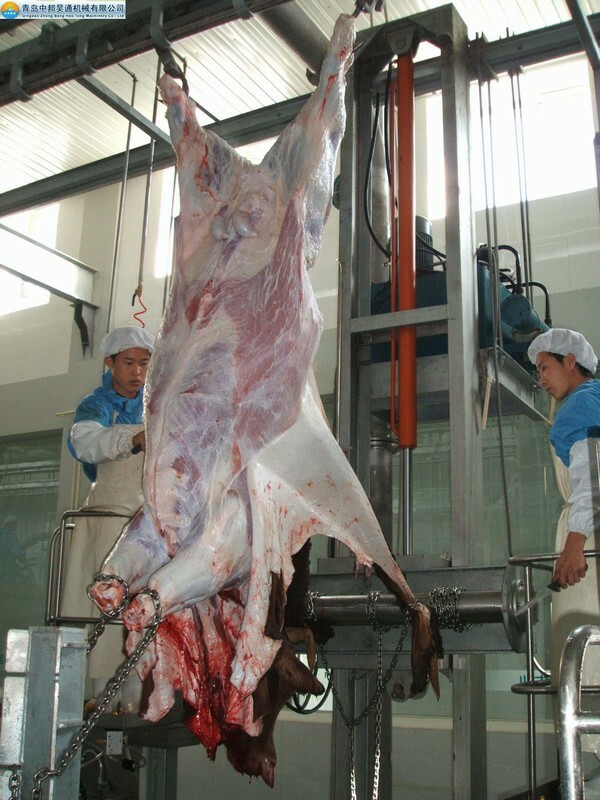 finished cattle carcass after passing into the esophagus bar ﹑ ﹑ cutting head dirty white and red chest and take other station. 2) The machine structure is simple, easy, just gently press the switch to complete the passing process. Greatly reduce the labor intensity. ① Insert ball bearings Self-aligning ball bearings UCFU213 ② 1311 ③ 6204 ④ deep groove ball bearing short pitch precision roller chains connected chain 24A ⑤ cycloid reducer XWED3-74-649 and XLD1.5-4-43. ZBHT Slaughtering Machinery Co.,Ltd. manufacturing high-quality Cattle drive Hydraulic passing and supply OEM, ODM service according to your personal requirement. Our Cattle drive Hydraulic passing and other Cattle Slaughtering Equipment is not only good in quality but also competitive in price, welcome to inquiry us about the details of Cattle drive Hydraulic passing or other slaughtering machine products and accessory equipment.